In the humanitarian zone of Nueva Esperanza in the collective territory of Jiguamiandó, Chocó, Thursday December 6 wasn’t like any other night. At around 9pm the residents began to hear a loud droning in the sky above that brought back terrible memories from the 1990s, when the armed conflict was particularly tense and aerial bombings were an everyday occurrence. 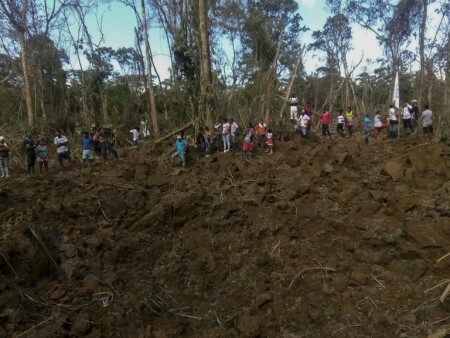 Suddenly airplanes passed overhead and began bombing the forested area right beside the settlement of Nueva Esperanza. The attack continued non-stop for three hours. “They were Kfir bombers, those war planes, and they were dropping bombs one after another. It was deafeningly loud! Everything shook like when there’s an earthquake,” recounted one resident of the humanitarian zone. 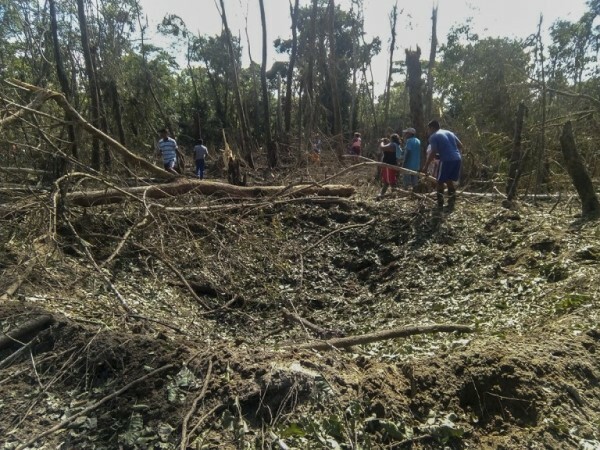 The day after, the Interchurch Commission for Justice and Peace (CIJP), accompanied by PBI Colombia, made a verification mission to investigate what had happened the night before and to bear witness to the impact of the aerial military operation upon the land and the residents of the area. According to locals, the bombs were dropped at the start of the operation on land around five minutes from the humanitarian zone, inducing fear and anxiety among the civilian population due to the proximity of the military operation so close to their houses and those of family members whose small-holdings are located even closer to the site of bombings. “The helicopters arrived after the bombings stopped,” a local resident told us. At that point, bursts of machine gun fire began to ring out directly above the humanitarian zone. The residents, terrified in their homes, lit torches, waved flashlights and started up the electric generators to call attention to fact that they were there; these lights their only protection in the middle of the night. During the verification mission the residents recounted the events: “We don’t know what targets the army were shooting at from the helicopters. They were hovering right above us; bullet cases fell from above onto the roofs of our houses.” One person told us how a bullet case broke through the zinc roof of his house falling onto the earth floor below. They were terrified as they didn’t know where the army were aiming their fire, there was no explication, no information, only noise and bullet shells falling from the sky. They asked themselves if the civilian population was the target of the operation or if were they being used as a shield? The fact that they were firing from the air right above the houses in the humanitarian zone meant that there existed the possibility that there would be returned fire from the area that the bombs had been dropped. If they were dropping bombs on an area it meant that there was presumed presence of another armed actor, otherwise why would they bomb there? However, the people there are the time say that they heard no returned fire towards the helicopters’ machine gun fire--according to them, there was nothing there. Why then had they bombed the area? The last bombing that the residents of these humanitarian zones remember was more than ten years ago. The resulting effects on women, men, children, and seniors, have been diverse. The psychological impact for some people has inevitably been to relive traumatic memories from the past and, for others, this has been the first time they have experienced the conflict this close. For all there remains a deep fear that it could happen again. It has also produced physical traumas, various people have been unable to rest or sleep, reliving the events each time they close their eyes. One woman from the zone told us how days after the bombing she jumps each time a firework goes off nearby, in Colombia gunpowder crackers are extremely popular over the Christmas period. The night of the bombing itself the children in the humanitarian zone cried out and whimpered throughout the night, the shock-wave produced by one of the bombs caused a young man to fall down the stairs of his house bruising his ribs, and many people had earaches and migraines the day after from the sound of the bombs and gunfire. Operations like this bring back memories of other eras in the history of the region, in particular to those who lived through the forced displacement caused by military and paramilitary operations Genesis and Black September in the 1990s. This time, however, the population says that they are all decided that they won’t go anywhere, they refuse to be displaced again, even as the presence of paramilitary groups threaten the zone and their communities. “Here we are on our land, we’re in a humanitarian zone and all the different armed groups should respect our rights as civilians,” stated one man defiantly.